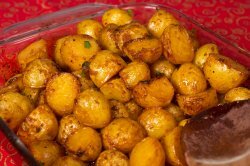 These roasted potatoes are the great side dish to any holiday meal. Seasoned perfectly with paprika and a splash of lemon juice, they are just the solution for boring roasted potatoes! Pizza is a favorite for kids of all ages. 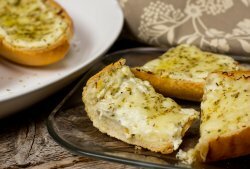 This white pizza version is just what you're craving, but with a tasty twist! Potatoe lovers everywhere will fall in love with these baked french fries. Perfectly seasoned and crispy, they are the perfect fry for your next meal! These potatoes boast a great salt and vinegar flavor and go great with a large variety of chicken, pork or beef dishes! These lamb chops are marinated in the perfect mixture of flavors to deliver a taste that's sure to be as good as the smell! 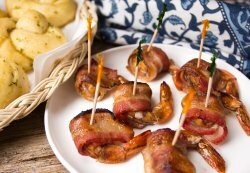 Serve for your Easter feast or whenever you're in the mood for a savory treat. This lemon cake features a delicious citrus tang with a lemon icing twist! Everyone loves bacon, so pair it up with this delicious pasta and homemade sauce for a meal that's sure to please. These little puffs are perfect for any party or snack. They are quick and easy to make and will delight all ages. Who doesn't love mac n' cheese? 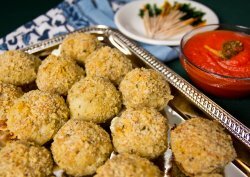 This recipe is your childhood favorite with a satisfying crunch courtesy of panko bread crumbs!